To celebrate the release on 12 October of the film ‘Suffragette’ (with which I had a slight association) I will post each day an image of a suffrage item that has passed through my hands. Panko was a card game, published by Messrs Peter Gurney Ltd. The cards were designed by E.T. Reed, a Punch cartoonist. 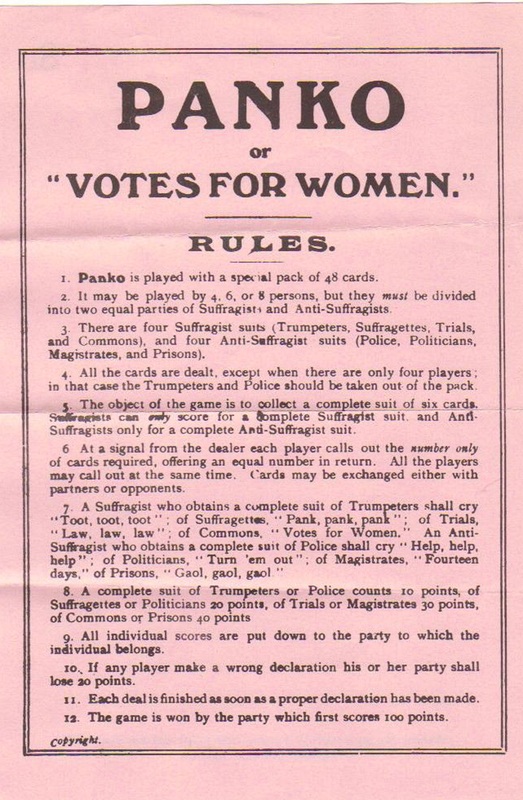 Panko was first advertised in the issue of Votes for Women for 10 December 1909, claiming ‘Not only is each picture in itself an interesting memento, but the game produces intense excitement without the slightest taint of bitterness’. Mary Blathwayt – the ardent Bath suffragette – gave her mother a pack as her Christmas present and I’ve no doubt that Panko was in many another suffragette’s Christmas stocking that year. This entry was posted on September 24, 2015, 8:35 am and is filed under Collecting Suffrage, Suffrage Stories. You can follow any responses to this entry through RSS 2.0. You can leave a response, or trackback from your own site.